Silver Crescent was established at 433 Hornby St. in January of 2017 by owners, Keira, Erick, and Eva. All 3 are keen enthusiasts of the Chinese Traditional Tea Ceremony, considering themselves as students and collectors of this craft. It's amazing to see how they're keeping the tradition alive, and to hear tales about how the tea process is helping everyday people in modern times. 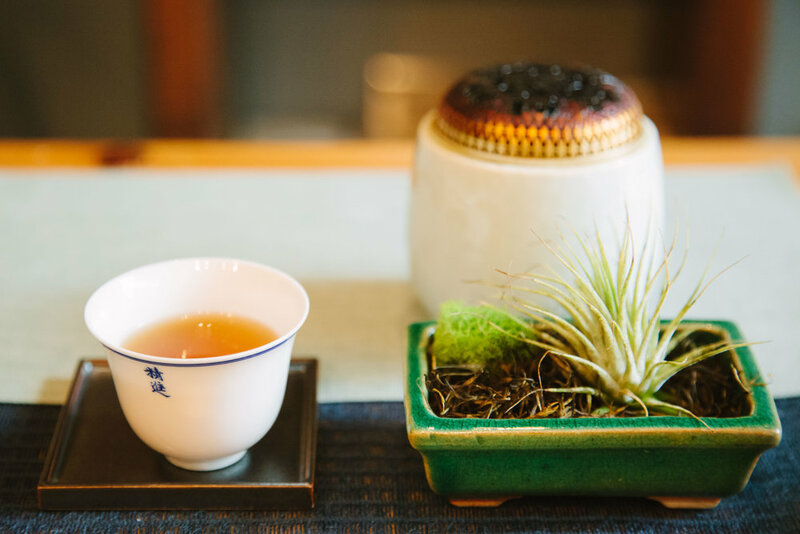 Whether to facilitate an engaging business meeting, to bring friends together for a heart-to-heart, or simply to be used to relax and unwind solo on a hectic, busy day in the city, the Tea Ceremony is so versatile. Whilst Keira and Erick were busy setting up a Tea Ceremony in the ‘Dry brew' style for us to try, we took a look at some of the delightful tea paraphernalia lining the tearoom. Lots of beautiful, and in some cases very old, artefacts, really illustrating the rich culture surrounding the tea drinking tradition. Now for the tea! The tea ceremony goes forth in the host’s personal style, in fact even the way the tea is poured is very telling of their personality. To practice tea, to practice the old culture, is a personal journey which gives others insights into who you are. It was incredible to observe how every detail has been carefully considered. Even waiting for the water to boil to the perfect temperature has a fine art- it's done by ear, you have to listen to the bubbles. I was very taken by a beautiful tea strainer – a curved dried out Gourd vegetable with a delicate silk screen. In fact natural materials were present throughout the whole tea serving process, including clay and wood. Chinese teapots are made from clay and do not use glazing. The clay is porous and tea oils are intended to build up inside the teapot over time, smoothing the taste of the tea and improving it by adding a unique taste. Teapots really do get better with age- they refer to this process as ‘raising’ the teapots. We tried a Pu Erh tea from 1992; the taste was very natural and pure, and the hot steam really awakened our senses. This ritual experience is a beautiful tradition that promotes deep conversation, allowing you to really engage with someone. It's so good just to put your phone down, listen, and sip satisfying hot tea. I would highly recommend tasting a tea or two at Silver Crescent Tea. It’s a refreshing, calming experience that really centres you. Almost like a meditation practice, you could even compare the experience to yoga. 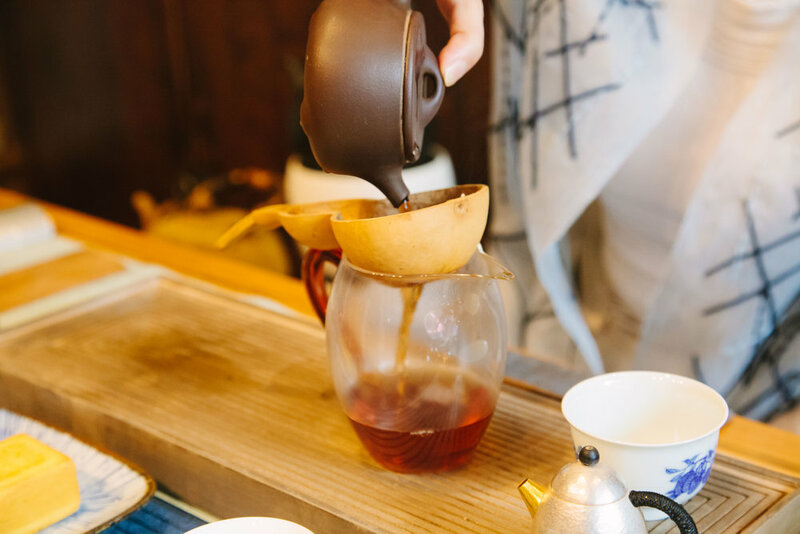 So instead of grabbing a coffee in a hurry, Micro Macro recommends taking some time to unwind with an experience at a traditional tea house in the heart of downtown Vancouver. Photos by Bang Jo (@4cheol).